One of the cherished memories of growing up was the imposing component system record player, radio eight track) that took center stage in our den. From that system flowed a rich assortment of music, Arthur Prysock, Aretha Franklin, Lou Rawls, and Dr. Martin Luther King Jr. Yes, one of these is not like the other, and for all you millennials, before there audiobooks there were books and speeches on vinyl, and I’m not talking about flooring. One of the albums in constant rotation were the speeches of Dr. Martin Luther King Jr. Like many brown-faced girls growing up in the South Dr. King was a cherished fixture in our homes and in our psyche. So, this album of his speeches was played often, and the principles which were espoused were deeply rooted in my being. The Strength to Love and Why We Can’t Wait and other writings by Dr. King filled our bookshelf. There was indeed the presence of “King” in my life. I appreciate this legacy. As I began to study the civil rights movement for myself and began to create my own place in the work I wrestled with a stark realization. Many historical narratives excluded or minimized the contributions of women. The legacy of Dr. King’s work is no different. We often hold him in this iconic and unapproachable space as if he were an island unto to himself. When he was more like a quilt that reflected the power, intellect ,and strength of those around him and this included the women. In the spirit of Dr. King’s Legacy of inclusiveness, we endeavor to shed light on some of the women who helped to create his enduring legacy, the legacy we celebrate today. Dora McDonald born in the Jim Crow South in 1929 was an unsung heroine of Dr. King’s inner circle. McDonald served has Dr, King’s personal secretary from 1960-1968. If we layer this timeline of service over the timeline of Dr. King major accomplishments we see that McDonald was working with Dr. King at the height of his public service, the Nobel Peace Prize, the March on Washington, the Poor People’s Campaign all took place in this window of time. McDonald’s role had her deeply steeped in the everyday workings to create strategies to move the civil rights movement forward. In the preface of The Strength to Love ,Dr. King says” I thank Dora McDonald for her encouraging words and efforts to transcribe my handwritten draft to type.” She was his confidant and many would say his alter ego. McDonald would characterize her early political positioning as a moderate reformist, not one to rock the boat. 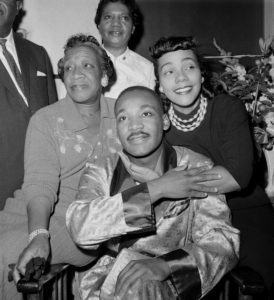 However after beginning her work with SCLC and Dr. King she would later say,” After I got into my job with the work that we were doing, and the impact we were having I would never want to do anything else.” Her dedication to the King and family transcended work responsibilities as it was Dora McDonald’s solemn responsibility to inform Mrs. King of her husband assassination . After Dr. King’s Death and McDonald would assist Mrs. King in creating the King center and archive her own journey entitled Secretary to a King. If you back’s not bent, then nobody ride you. This was triumphant motto of the highest-ranking female in the Southern Christian Leadership Conference ( SCLC) Dr. Dorothy Cotton. Dr. Cotton was the education director for the SCLC. She was responsible for creating and managing curriculum that helped disenfranchised African- Americans in the South to organize and strategize relative to the liberation of their communities. As the CEP director Dr. Cotton was masterful at translating the charismatic oratory of Dr. King’s message and taking it the masses. Dr. Cotton was a strong leader in the midst of scores of southern men, many preachers who were deeply invested in the patriarchy. Cotton was one of the women in the movement who courageously spoke to the existing sexism in the movement. After the death of Dr. King Dr. Cotton continued her work at Cornell University where the Dorothy Cotton Institute to promote a global community for civil right leadership was created in her honor. Dr. Cotton’s memoir If your Back’s Not Bent chronicles her journey and accomplishments in the civil rights movement. The observation of the King Holiday is presents us with the opportunity to be reflective about the legacy of all who were participants in the civil/human rights movement. We lift the names of these women on this day because we to remind us all that the work of women is an important part of the historical continuum in America. The contributions of all us are important to ensuring that justice, and equity continue to reign on these shores. I think it is fair to say that America would not be the America we know without the work, sacrifice of Dr Martin Luther King Jr. but as celebrate his life today let us also remember that we celebrate the effect of all those women who worked in shadows so he could shine the light.